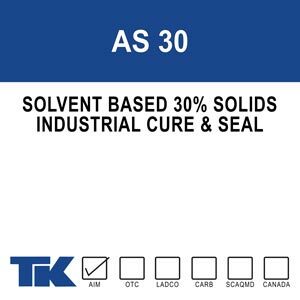 TK’s curing and sealing compounds are clear, durable, abrasion-, chemical-, weather- and UV-resistant. TK formulations strengthen paved surfaces to tolerate heavy traffic, extreme temperature changes, intensive ultraviolet exposure, road salts and all the hazards that make maintaining bridge decks, roads, docks, recreation areas and high-traffic surfaces a lifetime responsibility. As in much of life, most big problems start small. Concrete professionals know that seemingly tiny patches of cracking, spalling, exfoliation and dusting signal problems that can accelerate and destroy major construction projects with stunning rapidity. 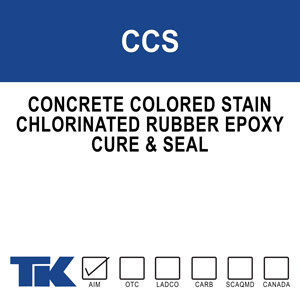 TK curing and sealing products are formulated to protect surfaces from the potential environmental damage that begins as soon as the concrete is poured. Products are designed for application to both new and existing concrete. Whether the requirement is a glossy-looking, nonslip terrace for a beachside hotel or safe landings at the airport, the right cure and seal products for drying time are essential to the reliable long-term performance of your concrete surfaces. Achro Seal 30 was designed for warehouse flooring that is specified and requires a 30% solids cure and seal. AS 30 is a solvent based, clear, methacrylate/acrylic copolymer resin that does not contain waxes or oils. It provides excellent resistance to damage caused by salts, deicing chemicals, oil, grease, fumes and heavy smog. Bright Glaze is a premium, high gloss, cure and seal for architectural, decorative, and masonry surfaces. Bright Glaze is 27.5% solids and is made from pure 100% methyl/methacrylate polymers. This formulation makes it the best choice for a lasting gloss finish sheen and superior protection from deicing salts, chemical erosion, and efflorescence. 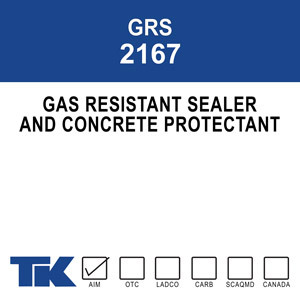 Gas Resistant Sealer 2167 is a specialized blend of 100% high molecular weight acrylate polymers. This formula produces the best protection against gasoline, oil, and grease and makes it the ideal sealing compound for automotive repair, airplane hangars, engine maintenance shops, and other concrete floors. 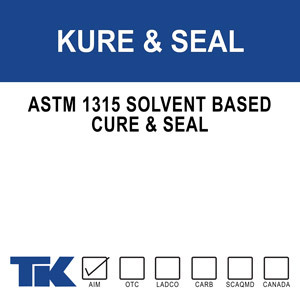 Kure and Seal 1315 is a solvent based, clear acrylic resin for curing, sealing and hardening new or existing concrete and masonry surfaces. 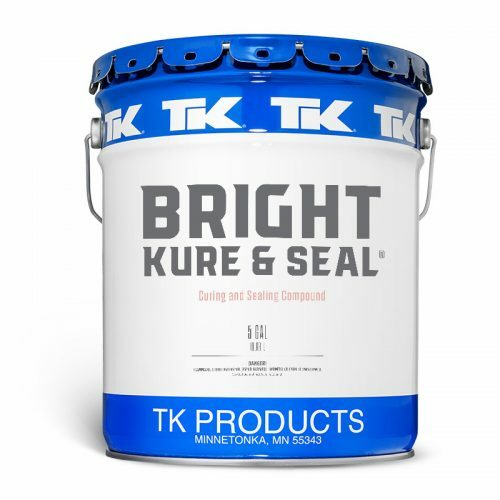 TK Products Kure and Seal is best suited for fresh poured non-colored concrete surfaces. A clear methacrylate/acrylic copolymer that acts as a one-step application for curing, sealing and hardening of new or existing concrete and masonry surfaces. 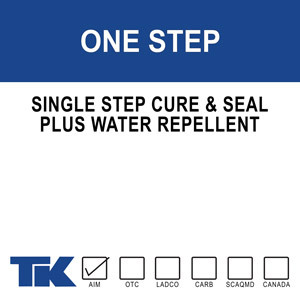 TK-ONE STEP is also formulated with siloxane for water repellency. • Resistance to damage caused by salt, oil, grease, mild acids and alkali, and stains from soot, smog, fumes, and gases. • Penetrates into the surface and binds together the small dusting particles, filling the voids to produce a hard, dust-free and brighter surface. • Siloxane penetrates into the surface to provide water repellency and protect against moisture damage and degradation. • Construction debris will not adhere to the surface, making cleanup easier and less costly. • Highlights the natural colors and increases the aesthetic value on terrazzo, brick, stone and decorative concrete surfaces. A premium-quality, clear curing, sealing and hardening compound for new or existing concrete and masonry. 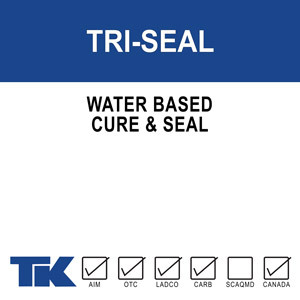 The 25% solids and high-quality resin make this the premier cure and seal on the market. “VOC” formulation meets VOC content requirements. 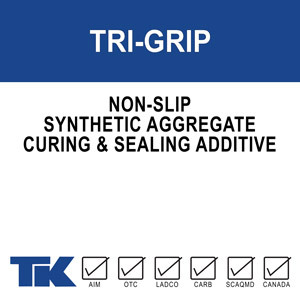 • Premium resin provides moisture retention that exceeds that of any other cure/seal on the market. • Maximum resistance to abrasion and damage caused by salt, oil, grease, mild acids/alkali, stains from soot, smog and gases, and ultraviolet rays. • Decreases the need for costly repair work and extends the life of the surface. A 100% water-based, high solids acrylic resin compound for curing, sealing, protecting and dust proofing new or existing concrete and masonry surfaces. 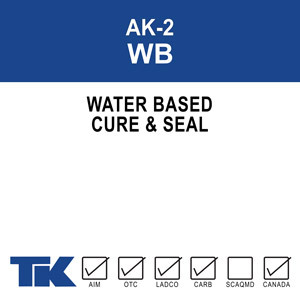 TK-ACHRO KURE AK-2 WB is also formulated to seal many types of porous tile and resilient water curing floor and wall coverings. • Water Based Clear Ideal for interior applications where solvent-based systems are difficult to use. • Provides maximum hardness and traffic abrasion resistance to the surface. • Construction debris will not adhere to the surface, making cleanup easier and less expensive. • Compatible with most carpet and tile adhesives. • Dries clear and provides a dust-free surface. A blend of 100% methyl/methacrylate polymers used as a superior curing, sealing and protective compound for exposed aggregate, colored concrete and other decorative concrete and masonry surfaces. Available in Gloss or Matte finishes. “VOC” formulation meets VOC content requirements. • The coating dries clear and does not yellow with age or exposure to ultraviolet rays. • Provides superior protection against freeze/thaw cycles, deicing salts, and chemical erosion and efflorescence. • Reduces the possibility of aggregate pop outs on exposed aggregate by percolating down and around the stones to fill gaps and voids. • Forms a durable long-lasting film with resistance to water, abrasion, and stains. • Highlights and preserves the natural pigments in the surface, adding longevity and sparkle to the finished product. • Does not discolor with over-use. • Reduces the possibility of aggregate popouts on exposed aggregate by percolating down and around the stones to fill gaps and voids. • Forms a durable long-lasting film with resistance to water, abrasion and stains. A water-based, 100% acrylic polymer compound for curing, sealing and hardening new or existing concrete and masonry surfaces. TK-KURE & SEAL WB is also formulated to seal many types of porous tile and resilient floor coverings. • Ideal for interior applications where solvent-based systems are difficult to use. 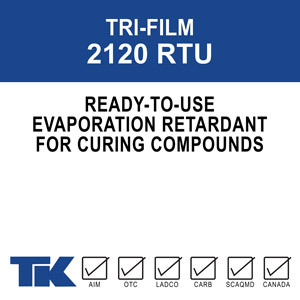 • Forms a tough, durable film that is resistant to mild chemicals and abrasion. A 100% water-based, high solids acrylic resin compound for curing, sealing, protecting and dust proofing new or existing concrete and masonry surfaces. TRI-SEAL 1315 is also formulated to seal many types of porous tile and resilient floors. • Provides surface strength with resistance to abrasion, pitting, deicing salts, grease, and oil. • Dries clear and provides a glossy, dust-free surface. A 100% water-based, high solids acrylic resin compound for curing, sealing, protecting and dust proofing new or existing concrete and masonry surfaces. 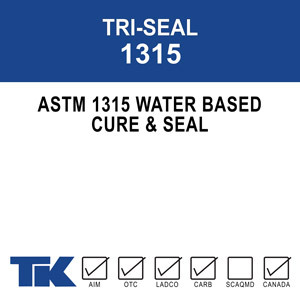 TK-TRI-SEAL 1315 is also formulated to seal many types of porous tile and resilient floors. A special formula of chlorinated rubber and epoxy that cures, seals and hardens new or existing concrete in one easy application. 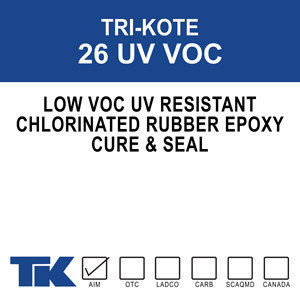 TK-26 UV VOC eliminates the need for further curing processes by retaining 95-98% of the moisture content of concrete over its critical 7-day curing period – ensuring stronger, fully cured concrete. It contains UV inhibitors which resist yellowing or discoloration due to sunlight exposure. 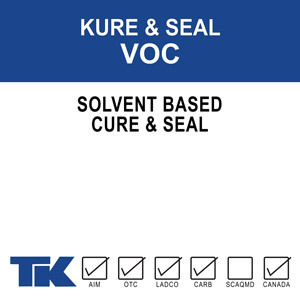 “VOC” formulation meets VOC content requirements. • Adverse weather conditions such as low humidity and high temperatures will not affect its performance (when applied at the proper time). • Penetrates as deep as 3/16″ below the surface on existing concrete. • Provides complete protection from sudden rainfall within one hour of application, as well as continuous protection from damage caused by freeze/thaw cycles, deicing chemicals, mild acids and alkali, salt, grease, and oil. • Arrests popping and retard spalling, flaking and other serious surface disintegration. • Eliminates dusting in new concrete and stops dusting, flaking and leaching of free alkali in existing concrete. High solids, pigmented, chlorinated rubber/epoxy that cures, seals and protects previously patched or mismatched concrete. 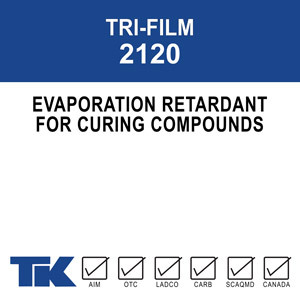 TK-CCS masks surface inconsistencies while imparting a uniform and attractive finish that is protected from the elements. Available in standard colors. • Hides concrete color variations/shading due to placement and finishing procedures. • Superior to simple coating products in that it covers surface inconsistencies and allows for good penetration and adhesion with the surface. • Prevents pop-outs on patched concrete by sealing surfaces off from water and chemical intrusion. • Provides excellent resistance to abrasion and chemical attack. 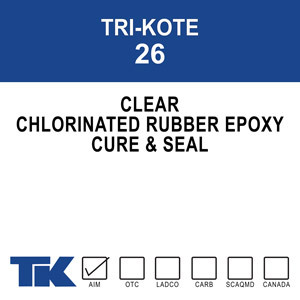 • Compatible with most chlorinated rubber or acrylic based curing and sealing compounds. • Does not yellow or discolor. A high solids, pigmented chlorinated rubber that cures, seals and protects previously patched or mismatched concrete. 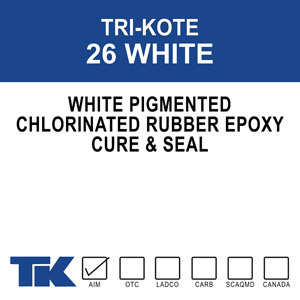 TK-DOT STAIN masks surface inconsistencies while imparting a uniform and attractive finish that is protected from the elements. 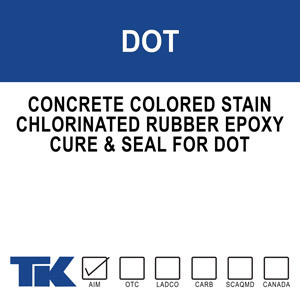 TK-DOT STAIN is specifically formulated for Department of Transportation (DOT) projects. Available in standard colors. A special formula of chlorinated rubber and epoxy that cures, seals and hardens new or existing concrete in one easy application. 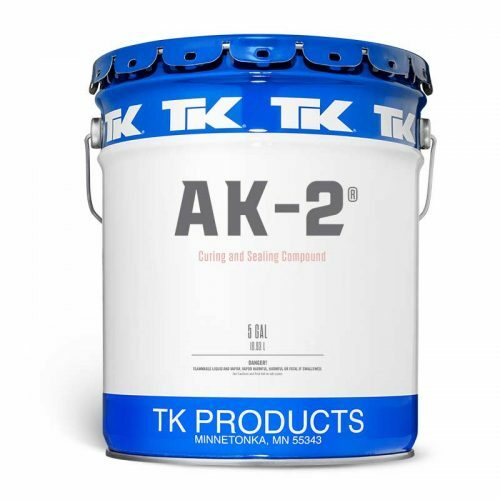 TK-26 eliminates the need for further curing processes by retaining 95-98% of the moisture content of concrete over its critical 7-day curing period – ensuring stronger, fully cured concrete. • Arrests popping and retards spalling, flaking and other serious surface disintegration. A special formula of chlorinated rubber and epoxy that cures, seals and hardens new or existing concrete in one easy application. 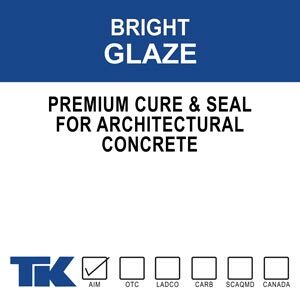 TK-26 UV eliminates the need for further curing processes by retaining 95-98% of the moisture content of concrete over its critical 7-day curing period – ensuring stronger, fully cured concrete. Contains UV (ultraviolet) inhibitors which resist yellowing or discoloration due to sunlight exposure. • Provides complete protection from sudden rainfall within one hour of application, as well as continuous protection from damage caused by freeze/thaw cycles, deicing chemicals, mild acids and alkali, salt, grease and oil. A special formula of chlorinated rubber and epoxy that cures, seals and hardens new or existing concrete in one easy application. 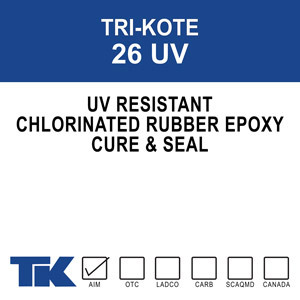 TK-26 UV eliminates the need for further curing processes by retaining 95-98% of the moisture content of concrete over its critical 7-day curing period – ensuring stronger, fully cured concrete. Contains a white pigment for reflectance (day or night). • Contains a white pigment which deflects the sun’s rays to prevent it from interfering with the curing process, as well as providing reflectancy at night. A 100% hydrocarbon resin, water/solvent based curing compound for fresh concrete. 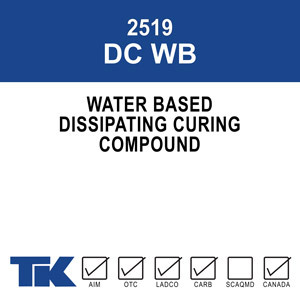 TK-2519 DC WB exhibits excellent curing properties and moisture retention for maximum surface density and hardness. 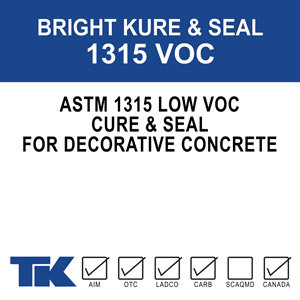 Designed to naturally wear away from the surface, TK-2519 DC WB leaves concrete ready to be coated with a multitude of protective and/or decorative topcoats and treatments. • Controls moisture loss and aids in complete hydration of the cement during the curing process. • Results in surfaces with maximum hardness and density. • Becomes brittle within weeks of application (typically 8 weeks under normal traffic conditions) and naturally deteriorates from the surface to leave it prepared for subsequent concrete coatings and treatments. • Creates a textured surface without sharp edges, lumps or bumps. • Increases safety and peace of mind in areas prone to becoming slippery. • Lightweight polypropylene spheres stay easily suspended in curing and sealing compounds, stains, epoxies, and urethanes. • Clear particles are unnoticeable on the floor. • Particularly effective when placing concrete in adverse conditions such as direct sunlight, high temperatures, low humidity and high wind velocity. • Does not interfere with the cement hydration process, nor with the application of curing compounds, sealers, waterproofing treatments or other coatings. • Provides a protective barrier to finishing procedures and makes these procedures easier and more economical. 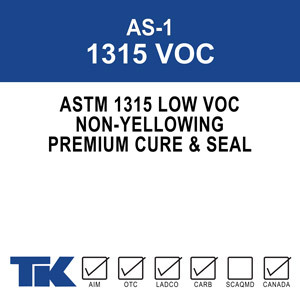 A color additive specifically designed for use with TK-BRIGHT KURE & SEAL, or TK-ACHRO SEAL AS-1 1315 curing compounds. 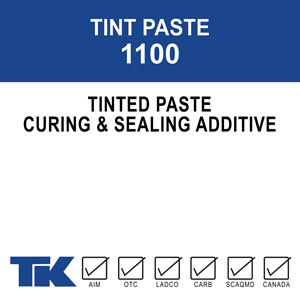 When mixed properly with these compounds, TK-TINT PASTE produces an opaque, uniformly tinted cure and seal for a variety of applications. Available in 24 standard colors, or custom colors may be produced upon request. • Prevents concrete build-up and stickiness of stamping and texturizing mats, rollers, skins and hand tools. • Unlike powder releases, curing compounds may be immediately applied without extra washing. • The pleasant vanilla scent makes it suitable for both indoor or outdoor use.